MagicFest Toronto was a good time (although you wouldn’t know by looking at the website other than twitter dot com, since WotC has self-imposed media blackouts on gatherings of paper Magic). The floor was humming, there was plenty of action at vendor booths even late into Saturday, two Taking Turns decks lost their win-and-ins, and Toronto continued to impress as a city. Those vendor binders are no joke, with James and I finding plenty of deals on Saturday afternoon. I recall just as we started to poke through them that I didn’t really understand how there could be value left, since by now I’d expect players with a more active memory of card prices to have picked them over. That was not the case though, with multiple $5 foil Blood Artists to be found, under-priced Spire of Industries, and even a $15 foil Geth’s Grimoire. Add in the excellent donuts, the literal duck heart, and an impressively inexpensive barcade, and I was glad to be there. Without question the biggest story in Modern lately has been just how big of an impact Arclight Phoenix has made. Initially completely overlooked, it has now become a dominant force in both competitive formats. There were two in the top 8 of Toronto, and that same result can be found in basically every Modern event, whether it’s a Grand Prix or an MTGO daily. 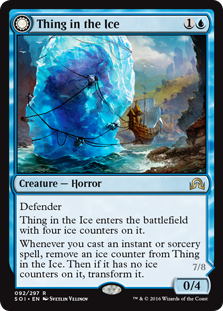 A ubiquitous component of most Arclight builds is Thing in the Ice. Since the deck plans on casting so many instants and sorceries for Arclight, TiTI is a natural addition. Get rid of any blockers, hit their face hard, etc. etc. TiTI fills the role well. 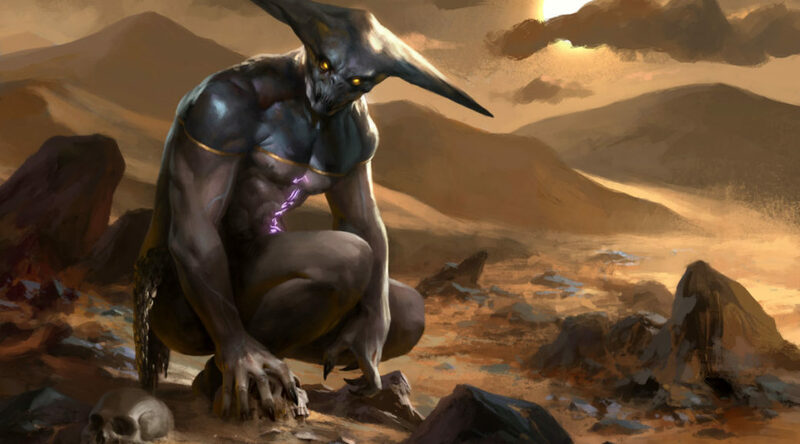 With the performance Arclight has been giving for the last month now, TiTI is fast becoming one of the most played creatures in the format – 10th right now, according to MTGGoldfish. Foils start at $22, and they don’t last long. They climb into $26 and $28 after barely a playset. Looking at the full supply, regardless of price, there’s less than 40 copies. 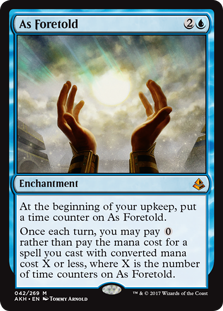 With how popular TiTI is in Modern right now, how unlikely that is to change (since when are cheap blue spells not going to be good), foil TiTIs are looking like a short to mid term guarantee. How does one cast those TiTIs and Lightning Bolts? With Spirebluff Canal, of course. The enemy-paired yin to Scars of Mirrodin’s yang, it quickly found a home in the format, which had been eager to see it and Blooming Marsh. (In contrast, nobody was really eager for Concealed Courtyard.) Admittedly I began by looking into Marsh, as I expected that to foreshadow better returns, but there just isn’t a lot of usage of the card at the moment. While the two The Rock decks made good use of it on Saturday, it simply isn’t seeing a lot of reps. That may change in the future – and with it, Marsh’s prospects – but for now, Canal is where the action is. 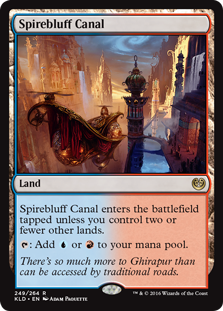 Izzet Phoenix is certainly the driving force behind Canal today, though there’s lots of decks leveraging the powerful intersection of its colors and speed. UR Living End builds are certain to run it, and really, any Electrodominance decks. Storm and various flavors of Blue Moon tend to want copies as well. Moving forward, I doubt this will change. Why would it? Izzet is a well established color pair that has proven time and time again that it has the chops to hang in Modern, even before Canal. Now that they have access to a land that so perfectly supports the lightning-quick gameplay that both colors are wont to play, we’re almost guaranteed to find a Canal deck in the top meta on any given day, whether or not Arclight Phoenix is involved. Anyways, prices run similar to TiTI. $18 will buy you a copy, but for your second, it’s going to be $20 or more. There are eight foil playsets with copies less than $30, and then the market is gone. Prerelease copies aren’t any bountiful. Given what Blackcleave Cliffs managed, I’d be surprised if we don’t see $40+ Canals in the next several months. A card I’d love to see do well simply because it’s cool, and who doesn’t love cool cards. From the get go As Foretold, affectionately ‘AF’ from here on out, was noticed by anyone that could read. It’s three mana, casts free spells every single turn, including the one you play it. And has the nifty feature of playing “free” spells for actual free. Bingo! I’m still hoping it will break Restore Balance, but until then, it’s still doing work with Ancestral Vision and Living End. Most recently someone ran UR Living End in what seem to be back-to-back MTGO Modern leagues, and earned 8th place and 1st place respectively. The list is straightforward, with 12 cycling creatures, Living End, Electrodominance, Ancestral Vision, and of course, AF. Between the 12 cyclers and a set of AV, plus some bonus Izzet charms, I have to imagine it’s not hard to plow through 10 or 15 cards pretty quickly. I especially love that with AF in play, you can chain AVs. I was torn between looking at non-foils and foils of AF. The non-foil prices are what’s listed, with demand for this likely to come from people needing sets for competitive Modern play. Since demand would be “new,” rather than established as with TiTI or Canal, there will be a rush for non-foils first. If a strategy establishes itself, then foils will get eaten up shortly after. Supply is deeper than TiTI or Canal, but not by all that much. There’s maybe 20 playsets on TCG, none on SCG, and no additional on CFB. Should one of these AF decks crack a paper Magic event – and that we hear about it, since apparently that’s a concern now – supply on these may drain rapidly.